Family Friendly First Fridays at Yanaguana Garden in Hemisfair Park kicked off this month with Mockingbird Fest! From playdates and story times there are plenty of activities going on at Hemisfair Park. But there's really no need to wait until then to bring your family downtown! You can have a playful and walkable family night any day of the week in Southtown. This is our first in what hopefully turns in to a series of family date nights in San Antonio. A couple weeks ago, we decided that we were going to get out of the house on a Friday evening. 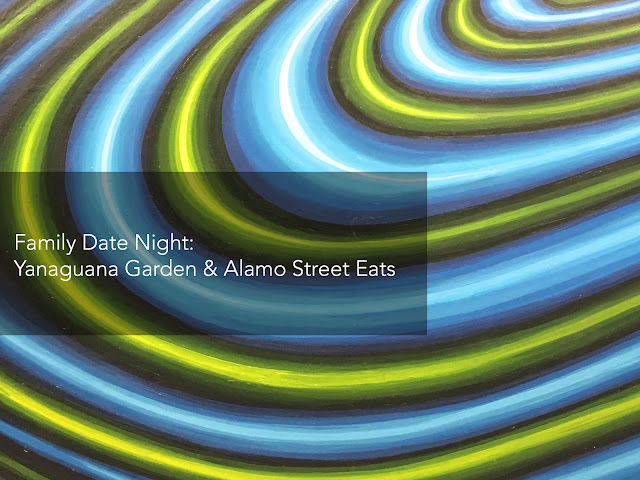 Wait lines at restaurants and noisy pizza places were all too unappealing, so we decided to start at Yanaguana Garden at Hemisfair park. We loved this park when it first opened in October and were having some beautiful winter weather! We picked up some extended family and parked across the street at a meter on Cesar Chavez. 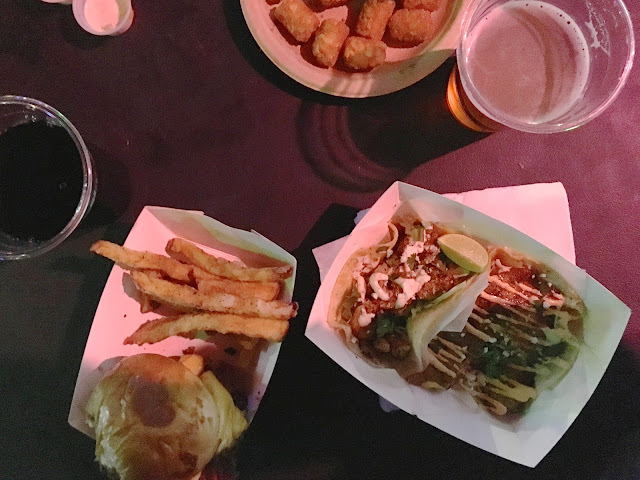 After we worked up an appetite, we just walked over to Alamo Street Eat Bar, a food truck park with about 5 different trucks and a bar that serves local beer on tap! They are open from 5pm to midnight and Friday/Saturday until 2am, so dinner is covered! Neither the park or the food truck place were crowded. From tater tots to pizza, fish tacos to burgers, everyone got what they wanted! We left both about 9pm and took a little walk through King William. My husband grew up in this neighborhood, and although it has changed quite a bit from 20 years ago, there are so many family memories that he shares with us on these walks. The kids love to hear about the time he flipped his bike because of that bumpy sidewalk on Wickes Street or when the bike fell in the river! We point out who used to live in which house, and the houses we used to covet when we were younger. More important, it's us, developing our family narrative. Like I talked about when we visited Mission San Jose. Knowing these bits and pieces of our family's history helps us to feel like we are a part of a greater purpose. Knowing that we have roots gives us a stronger sense of who we are helps us to have better control over our lives. And doing this all over some gelato goodness makes it even sweeter. We walked to South Alamode Panini & Gelato Company to try some and we just keep going back. The flavors change all the time, depending on what is in season. Below is a lemon flavor with sprinkles, but we've tried Mexican chocolate, stracciatella and more that we can't pronounce. If you have any more ideas for a family date night, please send them our way. I think it's a great way to get some quality time with our twins during our busy schedules! That looks like so much fun and so good!! That gelato looks AMAZING!! !